Larkin City, Maine is a fictional harbor town featured in the Collective Obsessions Saga by Deidre Dalton. 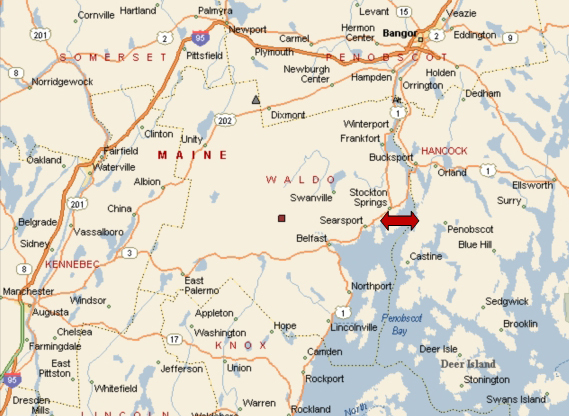 Larkin City is located in Waldo County, which is in the heart of coastal Maine between the cities of Bar Harbor and Camden, and on the western shore of Penobscot Bay. Irish immigrant John Larkin settled a twenty-two mile stretch of Maine coastline between Searsport and Stockton Springs, where he formally established Larkin Village in the spring of 1867.
Notable buildings in Larkin City include Bruno's Café, the Amber Whale Tavern, Brickyard Square, Clyde's Billiard Hall, Banshee Point Hotel, Golf Course & Winery; The Byre Resort, Larkin City University (LCU), Silver Tassel Restaurant and the Coven Nightclub. John Larkin spared no expense when constructing his grand estate, completed in 1874 with the aid of renowned architect Richard Morris Hunt. The mansion was built on a steep incline Mr. Larkin christened Banshee Point, which was surrounded by a dense stand of pine trees and endless green lawns. At the top of Banshee Point was a path that led to the estate's lighthouse and the sheer, rocky cliffs overlooking the ocean and private beach. The house is a combination of vernacular Châteauesque and mock Tudor design with elaborate towers, spires and black-mullioned windows. Ivy and moss cling to the exterior walls, giving the mansion an eerie ambiance. The rooftop of the house can only be accessed from the lofty attic, where a door and steps lead to the apex. Rather than the simple, railed-roof platform found atop many coastal homes, John Larkin built his Widow's Walk so it ran almost the entire length of the house. Instead of wooden railings, the protective barriers are made of gray stone and reached high enough so people could rest their arms safely and look over the side. From the rooftop, Larkin City can be seen in the distance. For more, visit About Larkin City and the Larkin Estate. Several shops line Main Street in Larkin City, including eateries that sell fish and chips or steamed mussels in brown paper wrappers, soaked in vinegar and salt; a breakfast takeaway that specializes in blueberry scones and ham with blueberry biscuits, and a tourist shop that arranges for group windjammer rides on the harbor and bike rides through the valley. There are also several produce stands open in the summer featuring home-grown Maine staples: fresh meats, blueberries and blueberry products, smoked seafood, teas, beer, pine nuts, maple syrup, and a vast array of fresh fruits and vegetables. Many people came to settle in the harbor town, from as far away as New York, Connecticut and New Jersey. Larkin City University (LCU) has six colleges including medicine, law, computer technology, business, forestry and culinary arts. (Above): Map showing Waldo County, Maine. Larkin City is marked with the double-sided red arrow. Click on image to view larger size in a new window. [Maps: Microsoft Corporation]. 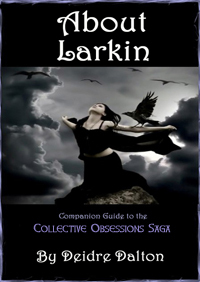 About Larkin is a free bonus guide to the Collective Obsessions Saga by Deidre Dalton. The guide offers insights to the backdrop in the family saga, such as particulars and images of Larkin City and the Larkin estate in Maine. Because the story spans more than one hundred years, facts and entertaining personal trivia were compiled by the author during the writing process. The book cover for About Larkin was designed by Webs Divine, with stunning image art from Magickal Graphics. Images contained in About Larkin not created by the author are fully credited.